New Creative English funding now available! FaithAction has been successful in securing a bid with the Ministry of Housing, Communities and Local Government, which will lead to Creative English classes being delivered at 55 hubs across the UK. Partnership between hospitals and churches that trains volunteers to carry out repairs on hearing aids highlights the vital contribution of faith-based work to public health. We’re a proud member of the VCSE Health and Wellbeing Alliance, a partnership between the voluntary sector and the health and care system to provide voice and improve health and wellbeing for all communities. 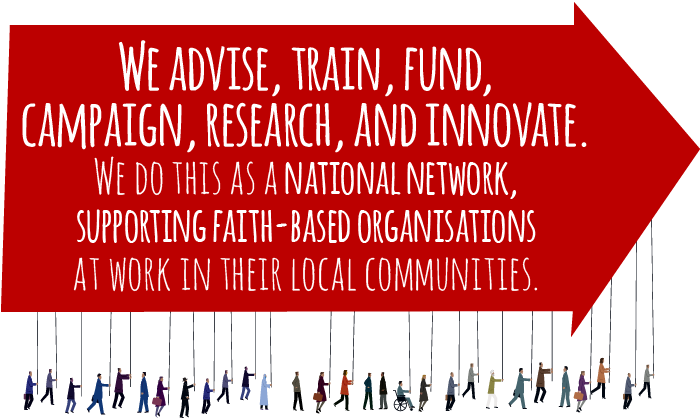 Our Faith Manifesto contains seven proposals aimed at politicians, policy makers and funders with the aim of securing stronger partnerships between government and faith groups. Join the programme that’s already helped over 6,500 people learn conversational English skills through fun and engaging drama-based sessions!